Health care stocks came down with a bad case of competition-itis. Shares of leading insurers and drug stores tanked after Amazon, JPMorgan Chase, and Warren Buffett's Berkshire Hathaway announced they would enter the insurance business. They didn't offer many details, but investors swiftly punished traditional health care companies anyway because of fears that the new venture could disrupt the industry. Top insurer UnitedHealth (UNH) fell 3%, helping drive a more than 300-point drop in the Dow. Two other big insurers, Cigna (CI) and Anthem (ANTM), dropped more than 5%. Aetna (AET) and Humana (HUM) were each down about 3%. Drug store giants CVS (CVS) and Walgreens (WBA) both declined more than 4%. Pharmacy benefits manager Express Scripts (ESRX) plummeted nearly 7%. The clear worry: The alliance of Buffett, Amazon CEO Jeff Bezos and JPMorgan Chase's Jamie Dimon is only the beginning of big changes for the insurance business. "This is the start of a restructuring of the health care industry. This could be the catalyst for something bigger," said Chuck Self, chief investment officer with iSectors. "It's part of the Amazon-ization of the nation, but it's now clearly more than just Amazon." In some respects, the entry of big new corporate players into health care could be more disruptive than Obamacare ever was -- or President Trump's efforts to neuter it. But other analysts wondered whether the market was overreacting. It's unclear just what Berkshire Hathaway (BRKB), Amazon (AMZN) and JPMorgan Chase (JPM) plan to offer their employees -- and how regulators will respond. "Considering the regulatory burden around every aspect of healthcare any new entrant in the space is at a huge disadvantage," Moody's vice president Mickey Chadha wrote in a report. Big insurers, pharmacies and drug distributors "already have large scale," Chadha said. That allows them to negotiate for better drug prices with pharmaceutical giants. What's more, some of the big health care companies are getting even bigger -- and more deals could be on the way after CVS agreed last year to buy Aetna for $69 billion. That merger has led to speculation that other insurers could be a good fit for Walgreens as well as Walmart (WMT), which operates a lucrative pharmacy business. 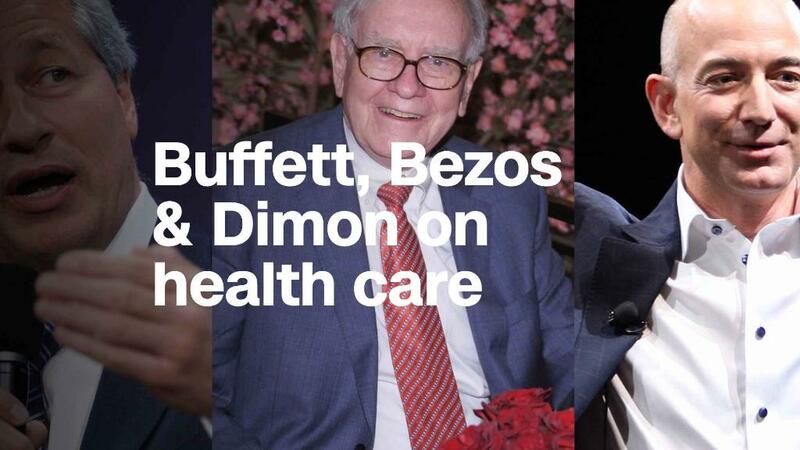 So even though the threat from a Berkshire-Amazon-JPMorgan partnership is formidable, health care's leading players aren't exactly tiny companies that will roll over easily in the face of new competition.